Wednesday night: Mainly clear & chilly. Upper 20s to low 30s. Thursday: Sunshine gives way to advancing clouds. Milder! Low to mid 50s. Friday: Varying sun & clouds. A few passing showers – esp. north. Near 60! Another bright, beautiful spring day is in store across the area. Temperatures won’t be as warm as Tuesday courtesy of the onshore flow. On Tuesday, temperatures overachieved by reaching 50 degrees. With an east wind, it will only be in the low 40s along the coast. 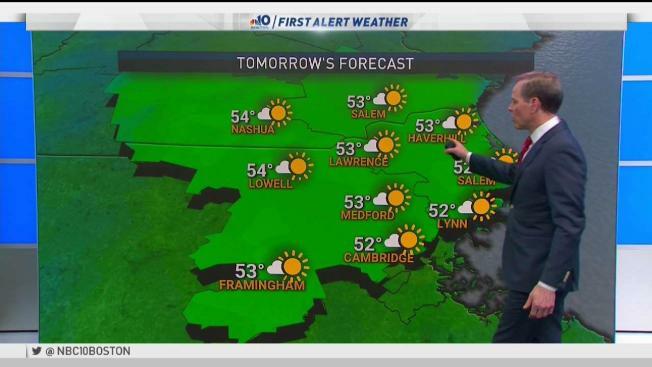 Even though it’s chilly, it will be very sunny. Once again it will be cold Wednesday night with temperatures back down into the teens and 20s. This might be the last really cold night of the season. Thursday, winds will be off shore again. This means temperatures will reach the low 50s again under sunny skies. Wednesday: Sunny and cool. Highs near 40 coast, mid 40s inland. Overnight Wednesday Night: Mainly clear. Lows in the 20s to near 30. Thursday: Warm up begins. Mostly sunny. Highs in the 50s. Clouds increase for the day on Friday with some showers in northern New England. Those showers won’t make it into southern New England. We will be climbing to 60 degrees on Friday afternoon. Saturday will be even warmer with high temperatures approaching 70 degrees in some locations. Mostly cloudy with a couple of showers possible but it won’t be enough to cancel your outdoor plans. Sunday the cold front moves through, which will drop temperatures during the afternoon. Before the front passes, high temperatures will reach the low 60s. Showers are possible throughout New England Sunday. The following week looks dry again. Temperatures should range from the 40s along the coast to low 50s inland.